After three straight years of getting dumped out of the NCAA Tournament in the Sweet Sixteen, Purdue is finally going to the Elite Eight. They seemed headed for a breezy win over Tennessee for the bulk of their game tonight, but a wild Tennessee comeback probably should have been enough to steal the game for the Volunteers and hang another brutal defeat on Purdue. Instead, Ryan Cline went off, and Purdue won in overtime, 99-94. The senior guard scored a season-high 27 points, 22 of which came in a second half where Tennessee dominated Purdue. The Boilermakers led by 12 at the half, and by as many as 18 in the second half, though their offense sputtered and died with 10:53 left in the second half. Their scoring drought last five whole minutes, a period that turned out to be enough time for Tennessee to erase the entire lead. Tennessee’s Grant Williams and Admiral Schofield outmuscled and outran Purdue, who looked too dazed to respond to the shift. 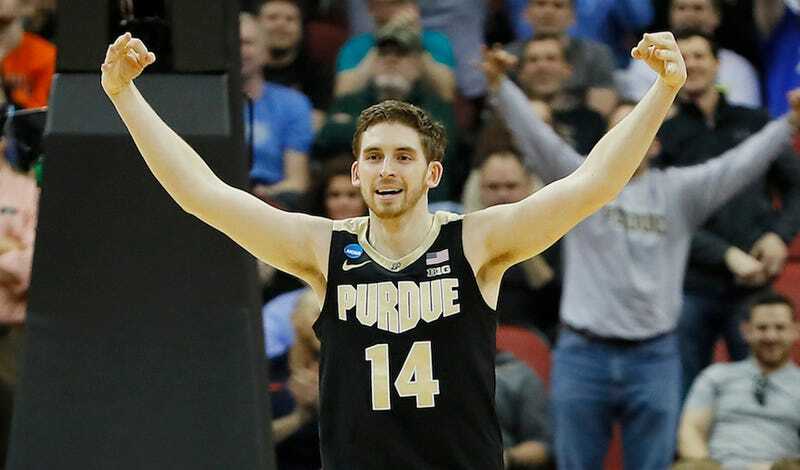 Except for Cline of course, who kept the Boilermakers alive with a series of increasingly audacious threes. Cline wound up with seven threes for the game, and four of those came in the last five minutes. Look at this bomb. One possession later, he nailed another one. While Cline was nailing those triples, Tennessee was imposing their will in basically every other part of the game. They scored 54 points in the second half, and should have at least had a chance to win the game at the buzzer (thanks Rick Barnes). By far the biggest shot made by Cline was his last one with Purdue down three and in desperate need of a three-pointer. With the larger, more athletic Grant Williams in his grill, Cline struggled to dribble around him, until he finally stepped back and popped one right in his eye. Grant Williams then got his second huge dunk of the final minute to put Tennessee up two with under nine seconds left. Carsen Edwards, who was phenomenal all night long for Purdue and led all scorers with 29, then hit two out of three free throws after getting fouled on a long ball. Rick Barnes’s genius-level 12th-dimensional coaching gave everyone what they wanted, which was five more minutes of this classic. In the extra frame, all the momentum generated by Tennessee dissipated and Purdue finally started rebounding and hitting their free throws (the Boilermakers finished the game 16-for-33 from the line, though they were 3-for-12 when Edwards stepped to the line at the end of regulation). Cline fouled out with two minutes left, though his team would have been on the losing end of a famous comeback had he not lost his mind in the second half.